Elongated Versus Round Toilet - Which Is Better Suited for Your Needs? In the case of toilets, there is more than one type to choose from. Most options are either elongated or round, so it’s important that you know what both of these types entail. Here’s a look at these two kinds of toilets and an explanation of their features, pros, and cons. Elongated toilets are a little bit bigger than round toilets in terms of bowl size. They usually measure about 18.5 inches long from the post holes to the edge. This means that the lid and bowl have an elongated shape, much like an egg. The actual size of the bowl is different from model to model, but the bowl will always be a little bit bigger than with a round shaped design. Easier to clean. This type is easier to clean, mainly because the bowl is big enough to get a brush in there and scrub it when you need to. There shouldn’t be a big problem getting those tough stains to disappear. Better for men to use. There is a lot of space for men to use, especially young men, if they have had problems reaching the bowl in the past. With elongated models, there’s a larger target for them. Gives you more space. Adults come in all shapes and sizes, so a toilet with a larger seat area will be more comfortable for most. You won’t feel like you are going to fall off or that you aren’t being protected when you sit down. With a bigger seat, you can feel more at ease in the bathroom, which will be better for your health and can help relax you when you need it most. Could have more powerful flush. There is a lot of room in the bowl to allow for a better flush. While this may not always be the case, it is commonly true. It may lead to you saving water, since you won’t have to flush extra times to get everything out of the bowl. The extra power when it comes to flushing may also prevent backups and clogs, since there is more power and water to help everything get where it’s supposed to be. Pricier. 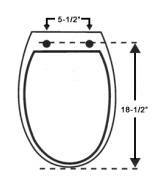 Since round toilets have been around longer, an elongated one may cost you a little bit more. However, depending on the models you’re considering, there may be a very low cost difference. 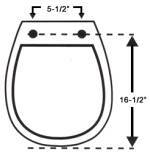 Round toilets have a smaller bowl and measure in at around 16.5 inches, but may be a little bit smaller. It has a round shape, which gives it an overall petite look compared to an elongated model. This makes it perfect for smaller areas, like half-baths, where you don’t need something too big or powerful, since it won’t be used as often as other bathrooms in your home. Suited for smaller spaces. If you have a small bathroom, you will likely want to get a round toilet. This is because it won’t take up as much space in a room and has a smaller footprint. Easy for kids to use. They are also great for kids, since children aren’t as big as adults and you don’t want them to fall into the bowl when they sit down. Additionally, it will be easier when it comes to potty training, where you shouldn’t have to buy extra products to help them start using the actual toilet. Good for special needs. Besides just children, it is sometimes easier for people that are older or that use a walker or wheelchair to use this type. The smaller unit allows for the chance of fewer accidents to occur. May cost less. The round toilet design has been around for a long time, so it may be cheaper than any other design when you are in the store looking at different products. Not the best for larger people. The truth is that you want to feel secure when you are using the facilities. In some cases, a round toilet with its small design and bowl simply won’t do and you’ll need something bigger. A larger seat area can make a big difference. Elongated Versus Round Toilet – Which is Better? It is hard to determine which one is better because it is really determined by your needs and the size of your bathroom. Both types are great for many situations and can be used over and over again without fail. It is more a matter of preference, so you’ll need to determine what yours is. After reading through the pros and cons you should have a better idea of what you want and be able to choose for yourself. One of the best ways to do this is to pay attention to the space you’re creating in your home, as you’ll want the toilet to fit into the design. It’s important to remember that even though these are the two basic shapes a toilet will have, there are a lot of variations too. Some may have higher pedestals than others and things like that, so take your time when you’re searching for your next model. Despite their differences, there are a lot of things that these two types of toilets have in common as well. They both come in a variety of colors and designs and they both do the job they are designed to do. The inner workings of them work the same as well; there is essentially no difference with the way they operate. There’s no reason to think one has better parts than the other. Many people love the look of an elongated toilet because it looks more durable and aesthetically pleasing, although some may be partial to round toilets. Go ahead and look at some models for yourself or do some research online to determine what shape you like the most. Generally speaking, elongated toilets are more common, so you might not even know the difference until you look a little closer into your own bathroom.